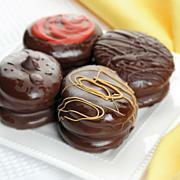 Dig in to these fluffy, individually wrapped treats that can be devoured fresh or frozen. A wickedly delicious alternative to cupcakes, the vanilla filling is similar to a light and fluffy vanilla frosting. They're perfect for picnics, parties or a midnight pantry raid. Delight in these rich desserts and embrace your inner kid again. Ingredients: SUGAR, ENRICHED FLOUR BLEACHED (WHEAT FLOUR, NIACIN, IRON, THIAMIN MONONITRATE, RIBOFLAVIN, FOLIC ACID), SOYBEAN OIL, MODIFIED CORN STARCH. CONTAINS 2% OR LESS OF: MONO AND DIGLYCERIDES, LEAVENING (BAKING SODA, SODIUM ALUMINUM PHOSPHATE), MODIFIED WHEY, SALT, SODIUM STEAROYL LACTYLATE, SORBITAN MONOSTEARATE, CALCIUM ACETATE, NONFAT MILK, XANTHAN GUM, GUAR GUM, NATURAL AND ARTIFICIAL FLAVOR, VITAL WHEAT GLUTEN, POLYSORBATE 60, EGG, SOY FLOUR., POWDERED SUGAR, EGG, WHITE, RAW, FROZEN, PALM OIL, MONO AND DIGLYCERIDES, POLYSORBATE 60, CANOLA OIL, WATER, CAKE FLOUR BLEACHED, ENRICHED - GM PURASNOW, VANILLA FLAVORING, CORNSTARCH, WHITE CHOCOLATE COATING, BAKING SODA, CANE SUGAR, PALM OIL, WHEAT STARCH, GLUCOSE SYRUP, ARTIFICIAL COLOR (YELLOW #6, YELLOW #5, BLUE #1, RED #3 AND TITANIUM DIOXIDE) AND SHELLAC. Love these! Very moist and delicious. My husband says they are the best! Delicious! a true New England classic! 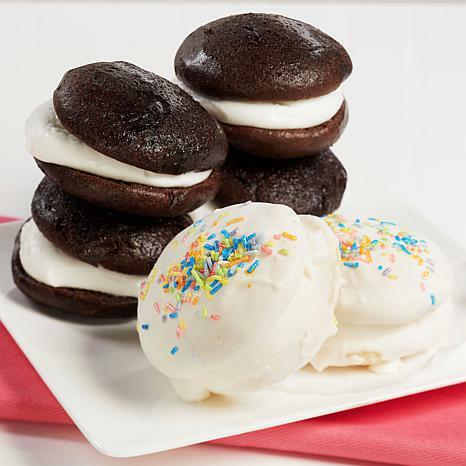 These whoopie pies are amazing! They are so fresh when they arrive and they are packaged beautifully. They come in bubble wrapped sleeves of 4 so they arrive intact. 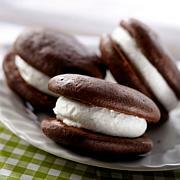 They taste like dense chocolate cake with a layer of sweet butercream. So good!! I spent a few weeks in Freeport Me a few years ago and discovered this shop. I have been buying them from their website but was am excited HSN carries them - now I have them on autodelivery for a better price! As a native New Englander having grown up on this treat, I was not expecting much. 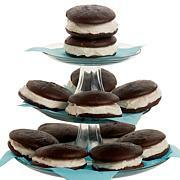 Truth be told, these are true to the original Whoopie Pie! The cake was moist...NO SPONGY! Cakey! Perfection! he cream was very sweet and yummy...again, perfect! Put them together and you have the wonderful, original confection for everyone to share! Love these and just the right size.